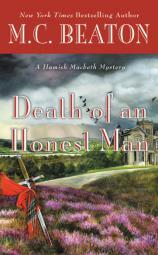 Sergeant Hamish Macbeth --- Scotland's most quick-witted but unambitious policeman --- returns in M.C. Beaton's new mystery in her New York Times bestselling series. He attended church in Lochdubh. He told the minister, Mr. Wellington, that his sermons were boring. He told tweedy Mrs. Wellington that she was too fat and in these days of increasing obesity it was her duty to show a good example. Angela Brody was told her detective stories were pap for the masses and it was time she wrote literature instead. He accused Hamish of having dyed his fiery red hair. He told Jessie Currie --- who repeated all the last words of her twin sister --- that she needed psychiatric help.